VANCOUVER, British Columbia (AP) -Slumping and split up on different lines, twin brothers Daniel and Henrik Sedin were reunited just often enough to spark some of their old chemistry. 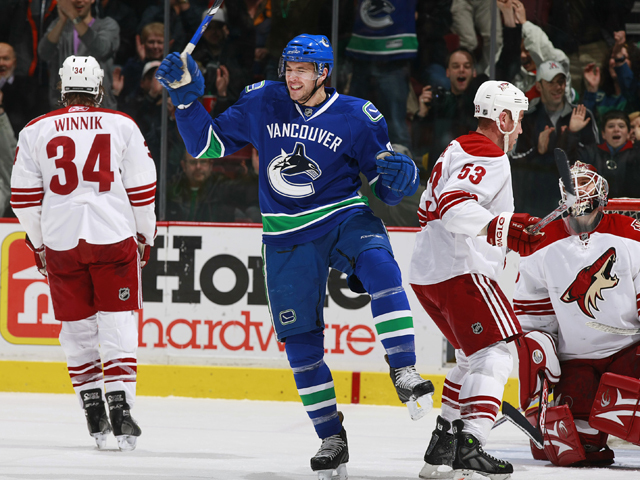 Henrik Sedin scored two goals, both on rebounds of shots by Daniel, to lead the Vancouver Canucks to a 3-1 win over the Phoenix Coyotes on Monday night. "If you don't score and you're supposed to score, it s always nice to get some goals," said Henrik Sedin, whose goals were his first not into an empty net in 17 games. "We got some bounces and went to the net a little bit more tonight and the whole team played better so it makes it easier." The struggling twins were broken up for one of the few times in their careers after being shut down in a 2-0 loss in Phoenix four nights earlier, and spent most of Saturday's win in Dallas on separate lines. They stayed apart for all but power play duty and "four of five shifts at even strength" on Monday, but that was still enough for both to end lengthy slumps. "It's great to see Hank score, he was right in front of the net on both goals and he stood up and played a good game tonight," said Daniel Sedin, whose two assists were his first points in the last six contests. "I think you have to shoot the puck and look for rebounds and then you can make plays. Maybe we got way from that when we were in this slump." Taylor Pyatt also scored on the power play and Roberto Luongo stopped 25 shots as the Canucks moved into a tie with Calgary and Colorado for sixth place in the Western Conference, two points behind Minnesota for the Northwest Division lead, and four points ahead of ninth-place Nashville. Daniel Carcillo scored for the Coyotes and Ilya Bryzgalov finished with 25 saves. Phoenix, 10th in the West, dropped seven points behind Vancouver for the final playoff spot with nine games left. "We're in tough. We know that," Phoenix coach Wayne Gretzky said. 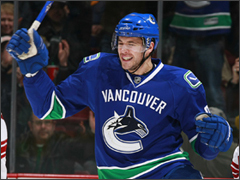 Henrik Sedin and Pyatt both ended lengthy goal-scoring droughts to stake the Canucks to a 2-0 lead. Henrik Sedin set up Daniel for a great chance at the side of the net, then came out from behind it to grab the rebound, lifting a backhand past Bryzgalov. Pyatt then shoveled a power play rebound under Bryzgalov 3 1/2 minutes later for his first goal in 20 games. "I was starting to squeeze the stick a bit so nice to finally get one and for it to be a big goal in an important game makes it that much better," Pyatt said. Carcillo, who drew a 4-minute high-sticking penalty 40 seconds in and got into a spirited scrap with Rick Rypien midway through the first, put Phoenix on the board with 1:55 left in the period. He hit the post midway through the second, but added to his league-leading penalty totals with a roughing penalty and 10-minute misconduct a few minutes later. "I thought Danny played a tremendous game," Gretzky said. "His penalty late in the (second) period where they ended up scoring their third goal, I thought the call wasn't warranted. It was two guys pushing each other and Danny gets the extra penalty. He's definitely a marked man." On the ensuing power play, Henrik Sedin dropped to Daniel for a shot and drove the net to bat in the rebound out of the air. Considered the scorer of the two Sedins, Daniel still doesn't have a goal in 13 games, but as he noted with a smile, he was playing on the checking line. "I didn't put the puck in tonight but if we keep creating this much, it will come," he said. The mood wasn't all upbeat for the Canucks, who lost speedy rookie winger Mason Raymond for four weeks after he suffered second-degree MCL sprain on a knee-on-knee hit from Phoenix defenseman Keith Ballard 7 minutes into the third period. There was no penalty on the play, but Canucks coach Alain Vigneault said he hoped the NHL would review it for supplementary discipline. "In my opinion that was a vicious hit," Vigneault said. "I didn't like that at all - knee on knee - and I m really hoping the league is going to review that."